Former House Speaker Newt Gingrich says he's among a handful of Republican candidates who are thinking about running for president in 2012. (CNN) - Former House Speaker Newt Gingrich says he's among a handful of Republican candidates who are thinking about running for president in 2012. "I think I'm probably on a list of seven or eight possible candidates at this stage," Gingrich reportedly told reporters in North Carolina Wednesday before speaking to a gathering of conservatives. Joe DeSantis, Gingrich's communications director, confirmed the accuracy of the quotes to CNN. "We have a lot of people around the country who would like to have somebody who represents a commitment to replace the current failed programs and to develop a set of solutions that are practical and workable," Gingrich also said. Among the other Republican candidates Gingrich named as possible 2012 contenders included former Alaska Gov. Sarah Palin, former Massachusetts Gov. Mitt Romney, and former Arkansas Gov. Mike Huckabee. Also included on Gingrich's list are Govs. Tim Pawlenty of Minnesota, Mitch Daniels of Indiana, Haley Barbour of Mississippi, Rick Perry of Texas and Bobby Jindal of Louisiana. South Dakota Sen. John Thune may also be a potential candidate, Gingrich said. Gingrich said he would make a decision about his own political future next year after discussing the prospect of a presidential bid with his wife. Gingrich's comments come days after organizers of The Southern Republican Leadership Conference - a high-profile gathering of party activists considered to be an initial venue for potential GOP presidential candidates - announced the former House Speaker will be among the list of Republican speakers. Palin and Pawlenty are also expected to attend the event. Gingrich also recently filed government paperwork to form a political action committee, named American Solutions PAC, according to Federal Election Commission records. The forming of a political action committee will allow Gingrich to raise cash and donate the money to federal and state candidates across the country. It could also be a sign that Gingrich is serious about running for the White House in 2012. American Solutions is also the name of Gringrich's political organization, which is incorporated as a 527 group, and is not subject to the same contribution limits as political action committees. Unlike PACs, 527s can also directly accept funds from corporations but are barred from directly contributing to a candidate or financing a potential White House bid. Wow, how nice it is to not be a republican right now. Barbour- HA! This is not the US of Dixie. Thune- Yes. Yes, he's their best bet. Either CNN is filtering comments or this page is infested with "fliberals". None of you flaming libs know a single thing about Newt or his beliefs. He's got a couple of books out there that you can read. There's not a single thing written in either of them that would warrant any of the ignorant comments I'm seeing here. But then again, self accountability and self responsibility are terms that "fliberals" hate. Fliberals think the gummant should decide everything. 'The gummant knows best how to provide for the citizens. Common citizens aren't capable of making decisions or managing their own affairs. We need more gummant control. People that are lucky enough to have worked hard all their lives should have to take care of the irresponsible masses, and the gummant will make darn sure they do.' Well, Newt doesn't agree with any of that rubbish and most of you don't either. You just parrot what you hear from the Communist News Network and More Socialistic Nonsense Broadcasting Company. as another indepenent that also voted for Obama, given the mess he was dealt with when he came into power,he is no doubt doing a tremendous job amidst the obstruction from the party with no ideas but only fear mongering and obstuction. Your party of no had 8 years and came up with nothing but disasters. THey still have no ideas. I have never seen a president working so hard, it is unprecedent and he will succeed. enjoy the ride. How is it that we didn't hear the name Newt Gingrich for 10+ years & all of a sudden he's back and thinks he's a serious contender for the White House? As far as Sarah Palin? She's the biggest joke on the planet & count me out if she somehow gets in. This is one American who will be living abroad as she wreaks havoc & destruction on this country. People need to be more patient. Raj A, you're as big a quitter as Sarah Palin herself. You voted for Barack Obama & the instant gratification hasn't come so you're just going to throw your hands up? You independents make me sick, almost as sick as "Conservative" Republicans. Pick a party or get the hell out. 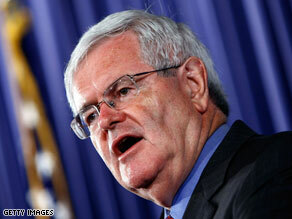 mister gingrich knows about change he has changed wifes about three times since 1997. HE IS NOT THE PERSON TO LEAD THE NATION IN THESE TRYING TIMES BUT TIM PAWLENTY TRULY HAS A CHANCE. Newt Gingrich has written some fantastic alternative history books. But I wouldn't vote for him for president. I love being a Democrat. Failed policies...funny how things are just starting to be fixed. Please oh please let gingrich run, the only other person that would make an easier re-election for obama would be palen. Let's tewt for Newt. Don't worry he won't waste any of his money. As for time the scum bag has lots of that. Sarah Palin – give me a huge break. Is the bimbo still watching the skies over Alaska for Mr. Putin? She couldn't run a state with a measly population of less than 700,000 and most of them live in one city. Don't you get it – she' just an opportunist and you morons are swallowing the whole scam. Let's assume she was to win (fat chance) and then finds it too hard and quits like she did as governor. That is the track record. Oh well! He certainly would be better than what we have now. Course most anybody would be. Errr...why did you vote for Obama in the first place? What "change" did you think he was going to bring you, that you now think republicans will bring you? I could have understood if you said you were not voting at all – because the process has proven that there's nothing worthy on either side. But this, this just makes you look like the mental midget you obviously are. Didn't senate republicans threaten to sue msnbc over ed schultz possibly running for senate, so why is it ok for sarah palin to be on fox news when she hasn't said she would not run for president? This is longer than the average comment, so if you hate that, skip now. * In 1996 Gingrich, who was Speaker of the House, shut it all down. Government closed for business. The reason claimed was the repubs were trying to slow government spending, but Gingrich slipped up in an interview and said it was because he was snubbed by President Clinton on a flight to Rabin's funeral in Israel. He and Bob Dole had been made to sit in the back of the plane, and he said this was the real reason for the shutdown. And he said it in front of a roomful of reporters. Point 1: Gingrich is ego driven and selfish and thinks nothing of putting the people and the country in peril because his ego has been bruised. * In 1997 Gingrich was charged with 84 ethics violations. Were these politics-as-usual charges? No, they didn't come from a big democratic consipracy, they came from a vastly republican congress. The vote against him was 395-28. Eventually they dropped all but one of the charges, then turned the final one over to the IRS, who bungled the case. Point 2: He is corrupt. * He's been married three times, and it is now known (and he has admitted) that he was cheating on wife number two with wife number three. Not our business? It was while he was leading the charge against Clinton for the Monica Lewinsky scandal. He claimed moral outrage. Point 3: He may be the king of hypocrisy. There are more. Why are the right wingers not saying the same things about this guy they still say about Bill Clinton? Can a republican commit any outrage that will turn the right against him? Can a democrat do anything that won't?